Omega-3 fish oil contains a high concentration of Eicosapentaenoic Acid (EPA) and Decosahexaenoic Acid (DHA), polyunsaturated fatty acids (PUFAs) derived from wild deep sea fish. These essential fatty acids (EFAs) are important for healthy development and function of brain and heart in growing children. Children (age 3-7): Chew 1-3 capsules daily. 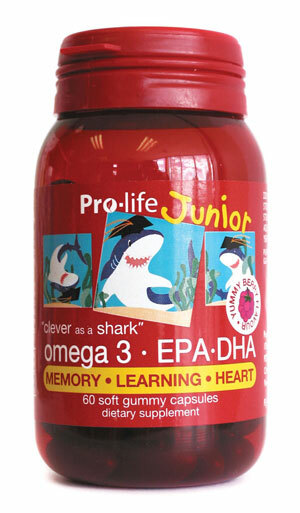 Children (age 8+): Chew 3-6 capsules daily. Take preferably with food, before school and after dinner, or as professionally recommended. The capsules can be chewed and swallowed. Or open the capsules, squeeze out the content and discard the empty shell. Care needs to be taken when given to younger children. Omega-3 fatty acids are a form of polyunsaturated fats, one of four basic types of fat that the body derives from food. (Cholesterol, saturated fat, and monounsaturated fat are the others.) All polyunsaturated fats, including the omega-3s, are increasingly recognized as important to human health. Omega-3 fatty acids include eicosapentaenoic acid (EPA) and docosahexanoic acid (DHA), both found primarily in oily cold-water fish such as tuna, salmon, and mackerel. Scientists made one of the first associations between omega-3s and human health while studying the Inuit (Eskimo) people of Greenland in the 1970s. As a group, the Inuit suffered far less from certain diseases (coronary heart disease, rheumatoid arthritis, diabetes mellitus, psoriasis) than their European counterparts. Yet their diet was very high in fat from eating whale, seal, and salmon. Eventually researchers realized that these foods were all rich in omega-3 fatty acids, which provided real disease-countering benefits. In addition, nutritionists have come to recognize the importance of balancing omega-3 fatty acids the diet. Because most people on a typical Western diet consume far more omega-6-rich foods (including cereals, whole-grain bread, baked goods, fried foods, margarine, and others), the ratio is out of balance for almost everyone. This means for most Americans the emphasis now needs to be on increasing omega-3s to make the ratio more even. The bottom line: Omega-3s appear to help prevent and treat various disorders in different ways. For example, research suggests that in individuals with non-insulin-dependent (or type 2) diabetes, omega-3s can improve insulin sensitivity. They work yet another way to ease menstrual pain, and so on. Improve heart health. Omega-3 fatty acids have been shown to play a part in keeping cholesterol levels low, stabilizing irregular heart beat (arrhythmia), and reducing blood pressure. Researchers now believe that alpha-linolenic acid (ALA), one of the omega-3s, is particularly beneficial for protecting against heart and vessel disease, and for lowering cholesterol and triglyceride levels. An excellent source of ALA is flaxseed oil, sold as both a liquid oil and a semisolid margarine-like spread. Omega-3 fatty acids are also natural blood thinners, reducing the "stickiness" of blood cells (called platelet aggregation), which can lead to such complications as blood clots and stroke. Reduce hypertension. Studies of large groups of people have found that the more omega-3 fatty acids people consume, the lower their overall blood pressure level is. This was the case with the Greenland Eskimos who ate a lot of oily, cold-water fish, for example. Improve rheumatoid arthritis, lupus, Raynaud's disease, and other autoimmune diseases. Diets high in omega-3 fatty acids (such as fish oils) have been shown to increase survival in people with autoimmune diseases. This is probably because the omega-3s help the arteries--as well as many other parts of the body--stay inflammation free. EPA and DHA are successful at this because they can be converted into natural anti-inflammatory substances called prostaglandins and leukotrienes, compounds that help decrease inflammation and pain. In numerous studies over the years, participants with inflammatory diseases have reported less joint stiffness, swelling, tenderness, and overall fatigue when taking omega-3s. In 1998, an exciting review of well-designed, randomized clinical trials reported that omega-3 fatty acids were more successful than a placebo ("dummy drug") in improving the condition of people with rheumatoid arthritis. The research also showed that getting more omega-3 fatty acids enabled some participants to reduce their use of nonsteroidal anti-inflammatory drugs (NSAIDs). Improve depression and symptoms of other mental health problems. The brain is remarkably fatty: In fact, this organ is 60% fat and needs omega-3s to function properly. Now researchers have discovered a link between mood disorders and the presence of low concentrations of omega-3 fatty acids in the body. Apparently, omega-3s help regulate mental health problems because they enhance the ability of brain-cell receptors to comprehend mood-related signals from other neurons in the brain. In other words, the omega-3s are believed to help keep the brain's entire traffic pattern of thoughts, reactions, and reflexes running smoothly and efficiently. Clinical trials are underway to further investigate whether supplementing the diet with omega-3s will reduce the severity of such psychiatric problems as mild to moderate depression, dementia, bipolar disorder, and schizophrenia. Interestingly, the oil used to help the child with a degenerative nerve disorder in the popular film Lorenzo's Oil was an omega-3 fatty acid. Aid cancer prevention and cancer support. Preliminary research from the University of California, Los Angeles, suggests that omega-3 fatty acids may help maintain healthy breast tissue and prevent breast cancer. Also, in a recent study, participants who supplemented their diet with fish oils produced fewer quantities of a carcinogen associated with colon cancer than did a placebo group. More research into this exciting use for omega-3s is underway. Pregnant women and infants need plenty of omega-3s to nourish the developing brain of the fetus and young child. If a pregnant woman gets too few omega-3s, the growing fetus will take all that's available. This could set the stage for depression in the mother. Talk to your obstetrician and pediatrician about specific requirements. There are no known side effects associated with increasing your intake of omega-3 fatty acids through foods, although fish oil capsules do pose the risk of a "burp" factor. This is a harmless, although not exactly pleasant, fish-y aftertaste that occurs with some brands of fish oil capsules.